Our entire X-Plain library is available in XML format for our partners to integrate with their own solutions. Our partners include vendors of hardware and software for healthcare. 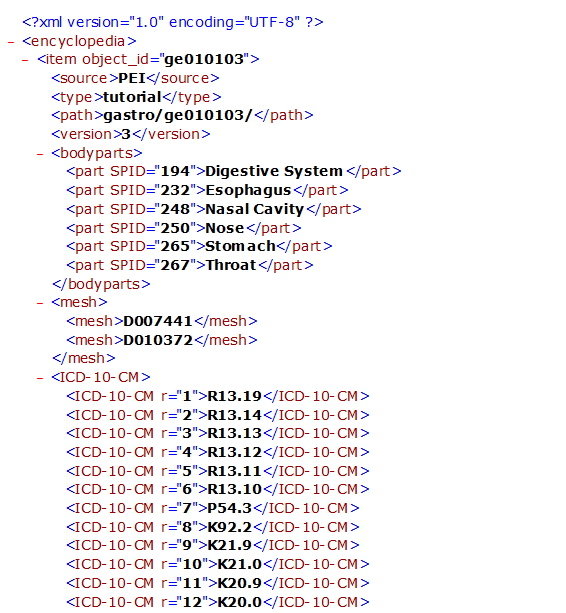 The X-Plain XML Database provides extensive metadata on each health topic. How is the X-Plain XML Database used? The X-Plain XML Database is for partners who develop websites, healthcare IT systems, telemedicine services, call centers, and other innovative healthcare solutions. We provide the textual and multimedia content of X-Plain in a standard database format, XML, for use within partners' applications and hardware. Where and when the patient uses X-Plain is up to the partner. What content is included in the database? The database houses all of our textual content, multimedia elements and metadata. Each topic contains keywords, synonyms, and medical coding. What topics are included in the database? The database contains the full X-Plain library of topics. However, we can limit the selection to a subset of topics in the language the partner needs. We offer five educational formats: overviews, full text, illustrated handouts, videos, and tutorials. If a partner wants just one or a few of the formats, we can limit the database as needed. Where is the content hosted and are updates automatic? Partners often decide to host the content on X-Plain servers but store documentation information on their own servers. In this scenario, content updates happen automatically when changes are made to a topic. If the partner decides to host the content on their own servers instead, there are several options for delivering updates. One approach is to automatically pull the updates from X-Plain's servers. Another approach involves using FTP (file transfer protocol) to deliver the updates. Contact us to discuss integration details. Is there a learning curve for the developers? Many programmers and developers are comfortable using XML. If our partners need assistance, we can show them how to pull the content and store documentation data. Can I purchase only the textual materials without the multimedia elements? Yes. You can sub-license just the textual materials. Can a partner white-label the content? Yes. Partners can enhance the content with their name and logo, as well as the name and logo of the client. We do require an X-Plain copyright notice in the footer or on the credits page. What is the pricing model for this solution? Partners who sub-license our content to their clients pay us royalties. The pricing model is based on the X-Plain product needed. The price for website content depends on how many medical libraries are needed. For a bedside solution, it is per bed. Corporate wellness companies pay per member. Please call us to discuss your solution so we can provide a quote. How can we evaluate usage and patient satisfaction? X-Plain tutorials can provide data about how many patients have completed and understood the tutorial. You can use this data as a first-level indicator of success. Additionally, we can provide you with patient satisfaction questionnaires along with structured research and evaluation studies. If the partner agreement is terminated, can I keep providing X-Plain to my current clients? Yes, you can keep serving your clients for a liberal grace period after terminating the agreement. Please contact us for a copy of our VAR partner agreement.